Buzz Aldrin, the American engineer and former astronaut, and the second person to walk on the Moon will signing copies of No Dream Is Too High: Life Lessons From a Man Who Walked on the Moon. He was the Lunar Module Pilot on Apollo 11, the first manned lunar landing in history. He set foot on the Moon at 03:15:16 on July 21, 1969 (UTC), following mission commander Neil Armstrong. He is a former U.S. Air Force officer and a Command Pilot. Please make sure to contact the bookstore for any special instructions for this event. If are not able to attend the event, you can also ask them if they can save you a signed copy. 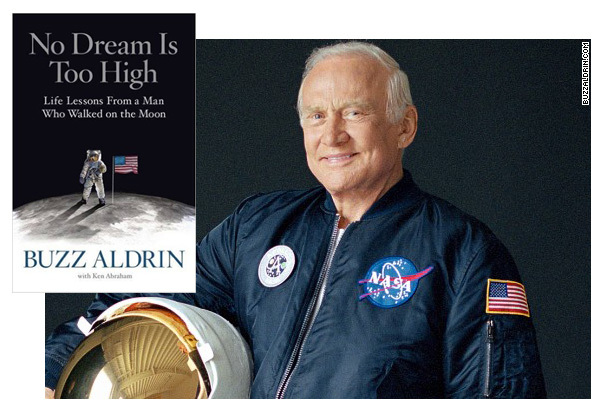 Beloved American hero and Astronaut Buzz Aldrin will be at Book Revue to speak about and sign his new book, No Dream is Too High: Life Lessons From a Man Who Walked on the Moon. Beloved American hero Buzz Aldrin reflects on the wisdom, guiding principles, and irreverent anecdotes he’s gathered through his event-filled life—both in outer space and on earth—in this inspiring guide-to-life for the next generation. KEN ABRAHAM is a New York Times best-selling author, known around the world for his collaborations with popular celebrities and fascinating, high-profile public figures such as former U.S. Attorney General John Ashcroft, Senator Bob Dole, former U.S. Senate Majority Leader Bill Frist and champion boxer and entrepreneur George Foreman. At present, Ken has more than ten million books in print. BUZZ ALDRIN, best known for his Apollo 11 moonwalk in 1969, holds a doctorate degree in astronautics and, at the age of 84, continues to wield influence as an international advocate of space science and planetary exploration. He has written four nonfiction books, two science fact/fiction novels, and two children’s books.